San Francisco (Obama.net)- The November 2nd Midterm Elections are less than three months away and the Democratic Party is still hard at work making sure that they maintain their seats in office come the morning of November 3rd. 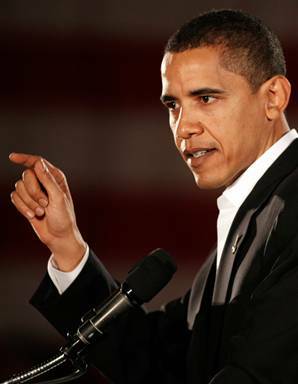 Wednesday, President Obama spoke specifically to unions in order to maintain their support come November. Obama once again reiterated his selling point that the election is truly a selection between the progressive Democratic policies, and reverting to the failed policies of George Bush and the Republicans. Obama personalized his words with the union members by reminding them that former President George W. Bush and his administration had “a profound animosity toward the notion of unions,” and that they designed a government that only helped a small percentage of the population. Obama made it clear to his audience of union members that it was not the Democrats, but the Republicans who “drove America’s economy into a ditch. And for the last twenty months…we’ve been shoving that car out of the ditch and they’ve been standing” and doing nothing to help. However, Obama did stress that it has taken many years to make the improvements that we have made so far and that to recover completely will in fact take a bit of patience on the part of the citizens of the United States of America. The Republicans may want to take control of Congress for the rest of President Obama’s first term in office, but it was the Republicans who caused the mess that Obama has spent the brunt of his first year and a half in office cleaning up.